The Galwegian flanker feels his team is capable of producing a similar performance to last season’s 34-6 home win over Leinster. 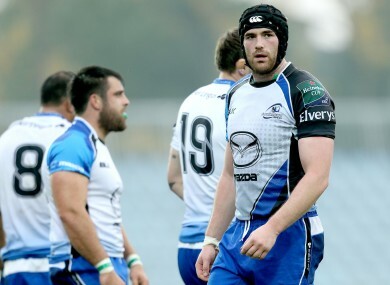 Andrew Browne is in line for his 100th Connacht cap this weekend. WHILE CONNACHT WERE creating Heineken Cup history against Toulouse at Stade Ernest Wallon, Andrew Browne was helping the ‘A’ team to a British & Irish Cup win over Bedford. The Galwegian may have missed out on the exhilaration of being there in person but insists the province are still riding high from December’s triumph. Browne has forced himself back into the senior set-up and wants to be involved in the next giant-killing adventure. Conveniently enough, Leinster are coming to town this Saturday. “Toulouse was the biggest ever Heineken Cup shock or definitely right up with the biggest,” Browne told TheScore.ie. “It was a remarkable win and, even though the lads were confident going over [to France] and doing a job, the win caught me by surprise. Browne was involved in the 13-16 loss to Leinster at the RDS in October, a game he call’s the province’s biggest disappointment of the season. “That was hard to take,” he conceded. “I came off the bench [on 63 minutes] and tore my hamstring after 10 minutes.” The flanker was replaced by scrum-half Paul O’Donohoe, who was forced to scrum down with winger Tiernan O’Halloran after Connacht were reduced to 13 men in the closing stages. The makeshift pack held out for two scrums but a penalty try was awarded as it crumpled at the third time of asking. “Pat [Lam] showed us video clip of the game on the Monday after the game. It highlighted Brett [Wilkinson], Sean [Henry] and Rodney Ah You and they made some amount of tackles in that game. That effort from your front row lads was something else,” said Browne. Connacht showed no signs of sitting back during Leinster’s visit to the Sportsground last season. The westerners ran in five tries in a 34-6 humiliation for their interprovincial rivals, scoring four of them in an astounding first half performance. “That was brilliant,” Browne reflected. “It was Dan Parks first start and we had Eoin Griffin and Dave McSharry causing mayhem in midfield. Email “Connacht targeting revenge after RDS heartbreak - Andrew Browne”. Feedback on “Connacht targeting revenge after RDS heartbreak - Andrew Browne”.